POSTED: Mon, 02/15/2016 - 17:00 | POSTED BY: Traci C.
It's almost that time of year again: time for the Disney Parks Egg-stravaganza. Once again this year guests at Epcot will have a chance to search for "eggs" themed after Disney characters and track their findings on a special map. Starting March 2 and running through March 27, the Egg-stravaganza maps can be purchased at several locations in Epcot. Guests can then use the maps to search for the eggs and then the maps can be turned in for a special surprise. Maps and stickers will be available for $5.95 plus tax at Pin Central, Port of Entry, Heritage Manor, and World Traveler. The maps must be turned in to the Port of Entry location by April 2 in order to receive the gift. Even if you don't find all the eggs you can still turn in your map and receive the surprise gift. 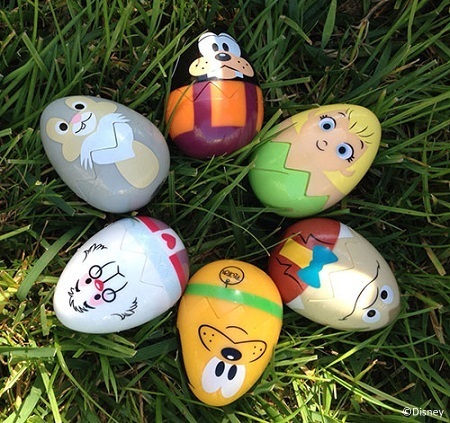 Are you planning to participate in this year's Disney Parks Egg-stravaganza? Let us know in the comments. I know it's sort of dorky, but I love the easter egg hunt. It makes me feel like a little kid again. We will be partaking in this event for he first time this year. I never knew such a thing was going on. I can't wait!! An Easter Egg Hunt, yippie! I never knew about this! We are heading down on March 2 and plan to visit EPCOT, I will definitely get in on this! Great activity to do with my grandkids! My mother, sister, and I are traveling March 14th and we want to Participate.